Excuse Me, Are You Using That Equipment? 14 Feb Excuse Me, Are You Using That Equipment? I left my gym frustrated the other day. I’ve worked out since I was 15 years old and when I hit my workout…well, I hit my workout. That trend has nothing to do with physical exertion. It has everything to do with technological intrusion. I counted seven people at various stations who were either on their phone or texting away. Now I don’t mind anyone using their phone – it’s just that I can’t quite reconcile why they choose to hold everyone else hostage when they do so. What drove me over the top was the 20 something guy who seated himself on the weight bench like he might his living room sofa and calmly spent the next 10 minutes vigorously working his fingers into a heavy sweat – while others could only hope to do the same thing with their exercise routine. It reminded me again that the wonders of technology have to constantly be balanced against the curse of technology – and those who succumb to the cloying siren of their phones are at the top as regards the latter. Which takes me to the larger issue as regards my temporary agitation. One of the first things I learned in my career was this simple premise. 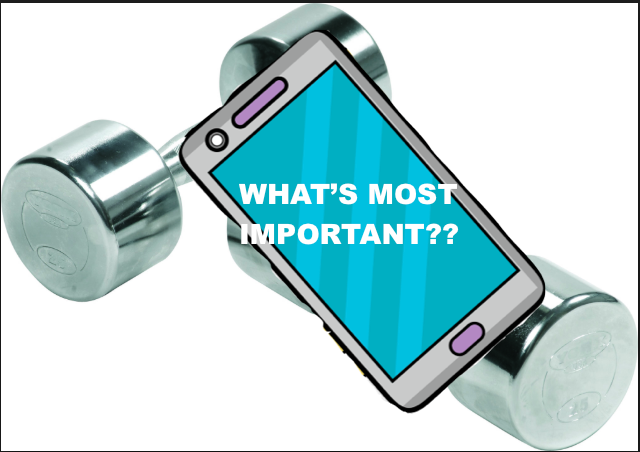 Make sure you make what’s most important – MOST IMPORTANT. Spoilers alert – very few. Not too long ago I talked with a corporate employee – frustrated by her leader who subscribed to the “everything is critical…just DO something” mentality. Overwhelmed by the flood of information that flowed past, the manager’s response was to push everything right down the chain of command. The net effect was a schizophrenic followership – and because EVERYTHING was important, NOTHING was important. The capacity to organize is important. The ability to prioritize is mission critical. The 1,440 minutes we each have today is not going to be expanded just because the leader decides it must be. That 60-minute workout I hope to get next trip to the gym might have to be. Time and energy management is wonderful to talk about – but it requires reining in the blistering tornado of information that swirls around us. My guess is that we have millions that are overdosed on information – and starving to death as regards legitimate insight. And that many more who can’t get to the core of what’s most important in their everyday lives – deciding instead to do everything – while accomplishing nothing.